A Log Analytics workspace in your Azure subscription. Learn how to create a Log Analytics workspace. First, complete the steps to route the Azure AD activity logs to your Log Analytics workspace. Download the views from the GitHub repository to your local computer. Navigate to your Log Analytics workspace. To do this, first navigate to the Azure portal and select All services. Type Log Analytics in the text box, and select Log Analytics workspaces. Select the workspace you routed the activity logs to, as part of the prerequisites. Select View Designer, select Import and then select Choose File to import the views from your local computer. Select the views you downloaded from the prerequisites and select Save to save the import. Do this for the Azure AD Account Provisioning Events view and the Sign-ins Events view. Azure AD Account Provisioning Events: This view shows reports related to auditing provisioning activity, such as the number of new users provisioned and provisioning failures, number of users updated and update failures and the number of users de-provisioned and corresponding failures. Sign-ins Events: This view shows the most relevant reports related to monitoring sign-in activity, such as sign-ins by application, user, device, as well as a summary view tracking the number of sign-ins over time. Select either of these views to jump in to the individual reports. You can also set alerts on any of the report parameters. For example, let's set an alert for every time there's a sign-in error. To do this, first select the Sign-ins Events view, select Sign-in errors over time report and then select Analytics to open the details page, with the actual query behind the report. 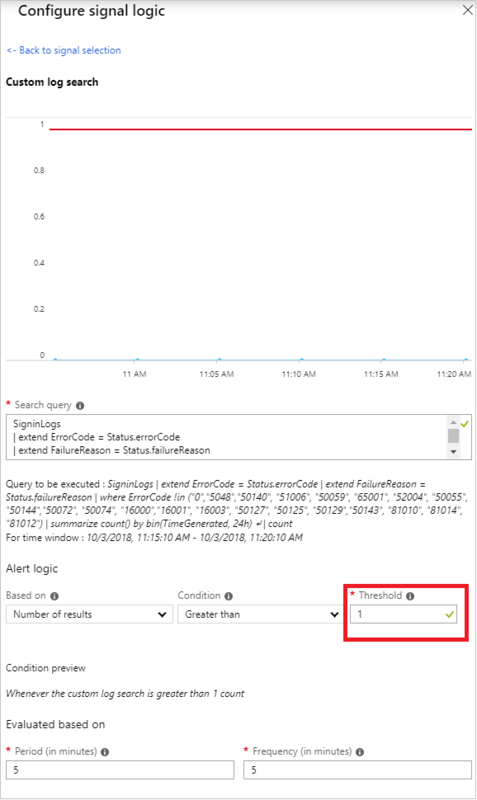 Select Set Alert, and then select Whenever the Custom log search is <logic undefined> under the Alert criteria section. Since we want to alert whenever there's a sign-in error, set the Threshold of the default alert logic to 1 and then select Done. Enter a name and description for the alert and set the severity to Warning. Select the action group to alert. In general, this can be either a team you want to notify via email or text message, or it can be an automated task using webhooks, runbooks, functions, logic apps or external ITSM solutions. Learn how to create and manage action groups in the Azure portal. 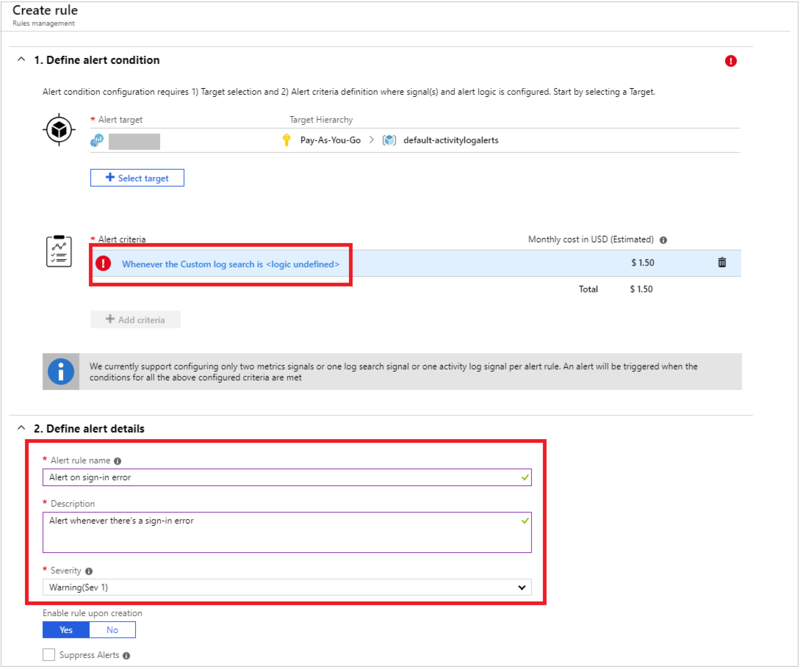 Select Create alert rule to create the alert. Now you will be alerted every time there's a sign-in error.